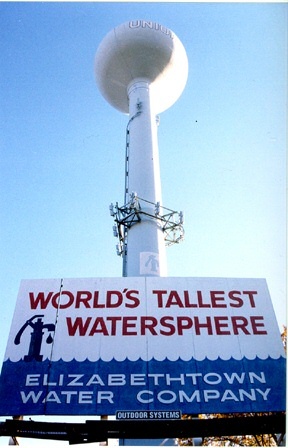 This photo of the World’s Tallest Water Sphere was taken in the fall of 1998 and shows a clear view of the Elizabethtown Water Company billboard, the ghost water pump logo, and the first cell antenna to gird the structure. Note that at this writing, the WTWS is still ghostly gray, but has 5 cell antennae, and the Elizabethtown logo is obliterated. Brian, like many Union residents, has the image of the WTWS burned into his subliminal subconscious. This entry was posted on Saturday, November 1st, 2008 at 6:37 am	and is filed under History, Photos. You can follow any responses to this entry through the RSS 2.0 feed. Both comments and pings are currently closed.